Over the last 15 years, singular spectrum analysis (SSA) has proven very successful. It has already become a standard tool in climatic and meteorological time series analysis and well known in nonlinear physics and signal processing. However, despite the promise it holds for time series applications in other disciplines, SSA is not widely known among statisticians and econometrists, and although the basic SSA algorithm looks simple, understanding what it does and where its pitfalls lay is by no means simple. Analysis of Time Series Structure: SSA and Related Techniques provides a careful, lucid description of its general theory and methodology. Part I introduces the basic concepts, and sets forth the main findings and results, then presents a detailed treatment of the methodology. After introducing the basic SSA algorithm, the authors explore forecasting and apply SSA ideas to change-point detection algorithms. Part II is devoted to the theory of SSA. Here the authors formulate and prove the statements of Part I. They address the singular value decomposition (SVD) of real matrices, time series of finite rank, and SVD of trajectory matrices. Based on the authors' original work and filled with applications illustrated with real data sets, this book offers an outstanding opportunity to obtain a working knowledge of why, when, and how SSA works. It builds a strong foundation for successfully using the technique in applications ranging from mathematics and nonlinear physics to economics, biology, oceanology, social science, engineering, financial econometrics, and market research. "[This] is the first book on SSA aimed at statisticians. The authors provide clear and concise descriptions of the basic methodology of this new technique, and this is a welcome reference text for time series practitioners. … This book provides the background to successfully understand and intelligently apply SSA. I strongly recommend it to anyone interested in time series analysis." "This book summarizes the results published on SSA in the last 15 years. It is a good source of SSA methodology for scientists who wish to complement classical procedures for time series analysis by SSA tools." "…the formal mathematical theory, which underpins the method, is laid out with admirable clarity. The authors have performed a service to the statistical community by writing this book. 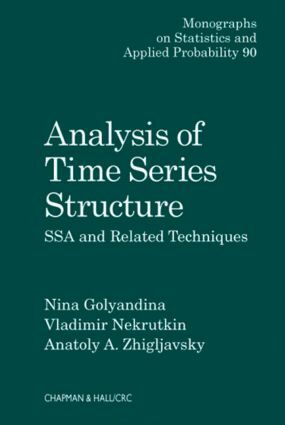 It is likely to become the standard reference to SSA; helpful to the applied statistician who wishes to analyse a times series and also to the theoretician who may wish to develop this interesting approach to time series analysis further." "The present monograph is dedicated to a recently proposed technique, singular spectrum analysis (SSA), that can be considered an extension of Pearson's problem to the situation in which the points in the space correspond to realizations of a time series…it is an important contribution to a modern area that is becoming increasingly needed in problems of electrical engineering, economics, meteorology, oceanography, and other fields. The authors should be commended for bringing this method to the attention of the statistical community."